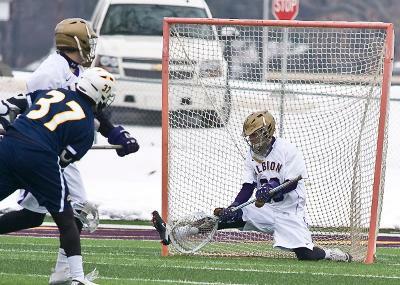 Kyle Formanczyk, Macomb junior, has been named the Michigan Intercollegiate Athletic Association Defensive Player of the Week for each of the first three weeks of the lacrosse season. He attributes this accomplishment to his consistent play, strong team defense and talent across the roster. At the age of 12, Formanczyk became inspired to play lacrosse by his brother. “He was an offensive player and needed a goalie,” Formanczyk said. In eleventh grade, Formanczyk was first approached by Albion College. He agreed to play for Albion because he knew he would be given a great opportunity to continue playing competitively. A loose and confident mentality on the field is a primary factor in Formanczyk’s success on the field. This mentality and work ethic has not gone unnoticed by teammate Tim Urso, Novi junior. Formanczyk inspires his teammates through his tenacity and passion for the game in spite of any adversity he and his team may face. Formanczyk plans to continue his stellar play and hopefully receive the award for a fourth week in a row, but above all, his expectation is to have his team qualify for the NCAA post season tournament.